Discover some of the most fantastic wines and fine dining experiences of New Zealand with this itinerary through the North and South islands. Enjoy stays at luxury lodges with exceptional restaurants as you indulge your taste buds and senses. Fly down the Dart River on a wilderness safari and take to the sky on a Milford Sound helicopter tour. When you’re ready to relax and enjoy the scenery, enjoy tours of wineries across the country as you sample some of New Zealand’s finest reds and whites on this 14 night New Zealand exploration. Upon arrival into Auckland, you will be met at the airport and transferred to your hotel. With more boats per capita than any other city in the world, it is no surprise that Auckland is nicknamed the City of Sails, or that it has hosted two America’s Cup challenges. The city also houses one-third of New Zealand’s population and the tallest tower in the Southern Hemisphere. Living large just seems to be a part of Auckland’s identity. Beneath all the bravado, however, lies a city with culture close to its heart. Museums, Maori influences, bustling markets and a myriad of restaurants specializing in world-class seafood make this a fun stop. For those looking for something a little off-the-beaten-track, take a ferry over to Waiheke Island and stay at The Boatshed, a boutique seaside hotel that features a cozy nautical feel blended with the ambiance of a luxurious intimate retreat. Get ready to Experience Auckland with a local Maori, who will guide you around this fantastic city and region, providing lots of information about the interesting history, places and people throughout the tour. Marvel at the 48 volcanoes, as well as the amazing West Coast with just a small group of like-minded guests, and a Maori guide as your host throughout the day. Experience some of New Zealand’s finest scenery in the Auckland region and explore some important historic sites while learning more about the fascinating Maori culture and history along the way. Walk on the crater’s edge of an ancient volcano and learn about Maori myths and legends that accompany the special places you visit. Discover dramatic cliff tops, stormy seas, unique black sand beaches and more on the famous ‘Wild West Coast’. Gain an insider’s view into Maori Culture through your Maori guide. See Takarunga (Mount Victoria) in Devonport, where significant Maori chief Patuone (and forefather of TIME Unlimited Tours Director Ceillhe) is buried and see Tamaki Drive, one of the world’s most beautiful city drives with sweeping views across the Waitemata Harbour. Your day also includes entry into Auckland Museum, a tour of the Maori and Polynesian section of the museum; along with a Maori Cultural Performance and the famous Haka war dance, made famous by our national Rugby team the All Blacks. 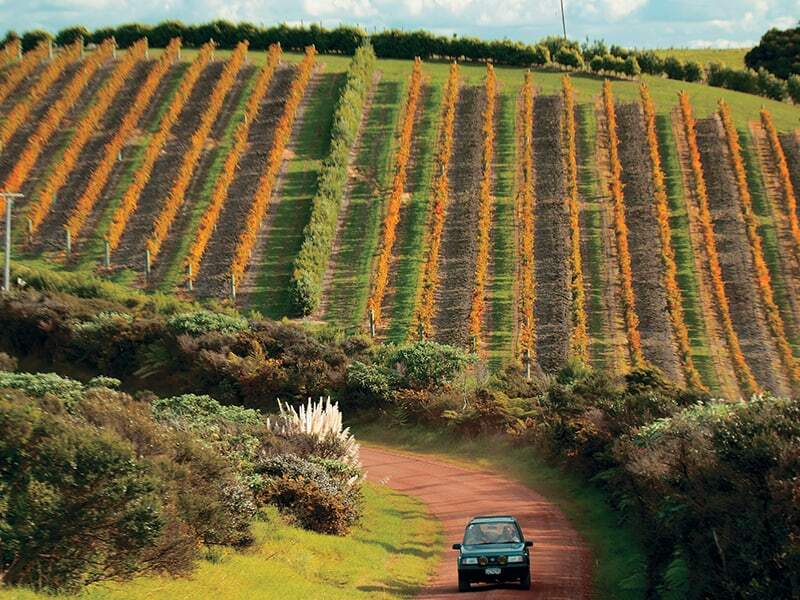 The Waiheke Gold Day Tour is for the truly discerning wine fan! Meet your host, Phil, at the Downtown Ferry Terminal, where you receive a welcome pack of mineral water, tasting notes and a full itinerary. Your stunning and memorable day begins with the 45 minute ferry transfer from Auckland over to Waiheke Island, on the sedate ‘Quick Cat’ Ferry. As you journey across Auckland’s spectacular Waitemata Harbour, Phil will run through your Waiheke wine tour itinerary and answer any questions you may have. Once at the Island, journey on Phil’s premium Waiheke wine tour – to taste wines at three premium boutique Waiheke vineyards (from: Peacock Sky, Cable Bay, Kennedy Point, and Mudbrick vineyards), plus an olive oil tasting. Enjoy a relaxed lunch at a renowned 5-star Waiheke restaurant. Soak in the stunning coastal scenery and enjoy the relaxed atmosphere on New Zealand’s own Treasure Island of wine and food. Set on a 6,000 acre sheep and cattle farm on the rugged coastline of the Eastern Coast on New Zealand’s North Island (where the cliff’s plunge 800 feet downwards) and on an amazing peninsula is the The Farm at Cape Kidnappers. Pure luxury awaits you in their beautiful suites, all with dramatic and breathtaking views of the farm and adjoining sea! Guided by a wine specialist, this is a fantastic day for wine lovers. Visit some of the more innovative wineries in the Bay, taste some of their wonderful wines, meet the people involved and hear their stories. An enjoyable and fun day. Acquire comprehensive wine knowledge of our wine industry, and we also visit special food outlets en route. Today you will transfer from Napier to Wharekauhau outside Wellington. Throw yourself into a bygone era and enjoy the grandeur and gracious lifestyle of the Edwardian times reflected in Wharekauhau. Wharekauhau (forry – ko-ho) offers a relaxed & yet ultimately luxurious environment to soak in some New Zealand hospitality. Set on over 5,000 acres of private land including rivers, forests and lakes, it commands spectacular vistas of the Pacific Ocean, and New Zealand farm-scape at the heart of the farm the main lodge is situated. As you wander into the grand lodge, what catches the eye is the awe-inspiring view over Palliser Bay, framed perfectly from every vantage point. Each room in the main lodge has a different feel, from large open lounges to smaller and more intimate areas such as the Palliser Room or Drawing Room. At the heart of it all you will find the Main Lounge, grand in design whilst remaining intimate in feel. Slide into an inviting sofa or armchair; take a moment to relax by conversing with fellow guests, or escaping into a good book. The elegant Dining Room flows through to the impressive Country Kitchen and conservatory where large marble benches and an open kitchen offer guests the chance to discuss the chefs’ secrets of the kitchen. Enjoy half a day visiting Martinborough and some of the 29 boutique wineries situated around this rural village. Discover the pleasures of the local wineries, tasting some of the world’s best Pinot Noir – International wine experts rate Martinborough as one of the finest wine growing regions in New Zealand. Your guide will take you around a choice of the best vineyards, and serious enthusiasts will have the opportunity to meet with wine makers for a behind the scenes tour of a vineyard. Take a spectacular 10 minute flight to Queens Wharf in Wellington, where you will be met and transferred to the airport terminal. Tucked away in Tai Tapu, just twenty minutes drive from Christchurch city in the glorious South Island of New Zealand is Otahuna Lodge. Built in 1895 for Sir Heaton Rhodes, a high-profile pioneer of Canterbury, the homestead is considered one of the best examples of unspoiled Queen Anne architecture in Australasia. Praised for its irregular shape, romantic rooflines, extensive use of New Zealand timber, and elaborate architectural detail, Otahuna is now protected by a Category One listing from the New Zealand Historic places trust. On this amazing tour, visit the extinct volcanoes of Banks Peninsula and view the beautiful harbors & green farmland. We make photo stops at scenic places and include morning & afternoon teas and a cheese tasting at the Barry’s Bay Cheese Factory. Once at Akaroa, included in your tour is a shared nature and harbor cruise on the Canterbury Cat. This cruise explores the volcanic harbor and sightings may be made of the world’s smallest dolphin – the Hectors Dolphin, NZ Fur Seals and numerous seabirds. If time allows, stroll through the village and along the waterfront, taking in the quaint French charm which is unique to Akaroa. Culinary excellence is a cornerstone of the Otahuna experience. A hands-on cooking lesson with Executive Chef Jimmy McIntyre provides an enjoyable overview of the philosophies behind the Lodge’s celebrated food and wine program as profiled in Bon Appetit, Conde Nast Traveler and The Financial Times. Classes incorporate a harvesting visit to Otahuna’s organic working gardens, provide an introduction to planning menus and offer a special chance to learn first-hand cooking techniques in our kitchens before tasting the results for yourselves. You will be transferred by private vehicle from Otahuna Lodge to Christchurch Airport. Originally settled by the gold miners and station owners, it is now home to all the adrenaline filled adventures such as bungee jumping, the Canyon Swing, jetboating, rafting, amazing scenic helicopter flights. Take a more sedate gondola ride to Bob’s Peak for great views or the 110 year old steamer, The Earnslaw as she cruises around Lake Wakitpu. You may wish to visit Milford or Doubtful Sound or the old gold mining town of Arrowtown. There are some interesting wineries such as Amisfield (great for lunch or early dinners) which is just outside the town. You will find all the souvenirs you need here for your New Zealand visit, including a ‘Lord of the Rings’ gift store. Queenstown is home to some superb restaurants that cater for all your appetite desires. The Cow (great pizzas), The Botswana Butchery (the name says it all), Bella Cuccini for Italian and Les Alpes for French cuisine. For the ultimate burger, visit Fergburger! A dinner reservation has been made for you at a local restaurant, the perfect way to sample the Kiwi cuisine. The Wilderness Safari takes you on a spectacular 90 minute jet boat journey through the Dart’s ever-changing braided river system, where you’ll be surrounded by snow-covered peaks, hidden valleys and waterfalls. It includes an easy guided 30-40 minute walk through the ‘Heritage Trail’ at Paradise, where your knowledgeable guide will enliven your walk with an informative and entertaining commentary about the ancient native beech forest, the unique flora and fauna, as well as the fascinating Maori and colonial history of the area. You’ll also journey by coach via a scenic back-road route, while hearing stories about the surrounding countryside and stopping to view scenery that has formed the epic backdrop for many international films, including ‘The Lord of the Rings’. Imagine mountains gliding by as your helicopter winds its way through the Southern Alps on an unforgettable flight to Milford Sound. Land, take a stroll and absorb the natural beauty of Fiordland. Your flight then sweeps the full length of the fiord until you reach the rugged West Coast offering a unique opportunity to view seals in their natural colonies. Experience a glacier landing before touching down at one of our secret wilderness sites for some ‘Over the Top’ hospitality including Champagne and cheese board. Fly back to Queenstown. This trip has been described as an experience of a lifetime and takes in some of the most spectacular scenery in the world. Savor the hidden delights of the world’s southernmost wine growing region in comfort and style. A mix of spectacular New Zealand scenery, fascinating regional history and a chance to visit a selection of delightful boutique wineries are the rewards of a truly great day out! The tour commences with a hotel pick-up at around 9.15am. You will visit Gibbston Valley Vineyard for a cave tour and wine tasting. On to Felton Road Vineyard for a winery tour and tasting before lunch at at one of the Winery Restaurants. During the afternoon visit additional vineyards and enjoy a scenic drive at Kawarau Gorge before returning to your Queenstown accommodation around 5.30pm. City hotel pick up and drop off is provided. Today you will be transferred to the airport for your departure flight to the USA.